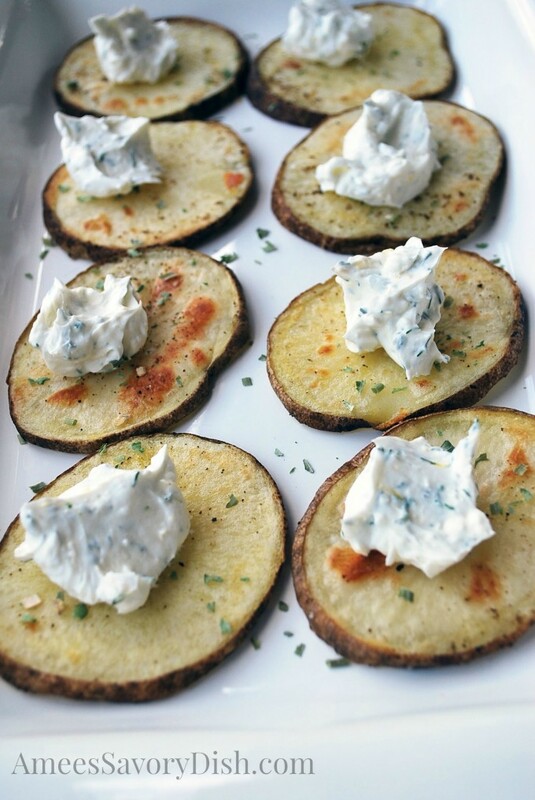 Smoked salmon potato rounds would be perfect as a healthy Superbowl appetizer or an elegant, bite-sized, snack at your next gathering. Need a tasty, protein-rich recipe for your next party? Smoked salmon potato rounds with creamy yogurt, capers, and chives are the perfect fix! I recommend serving them immediately for best taste and texture of the potatoes. Go for wild-caught smoked salmon, it has fewer calories than farmed salmon (about 32%! ), more calcium, iron, potassium and less sodium. Farmed fish also packs three times more saturated fat as wild salmon, so go wild!! You can also find this recipe featured on IdahoPotato.com. 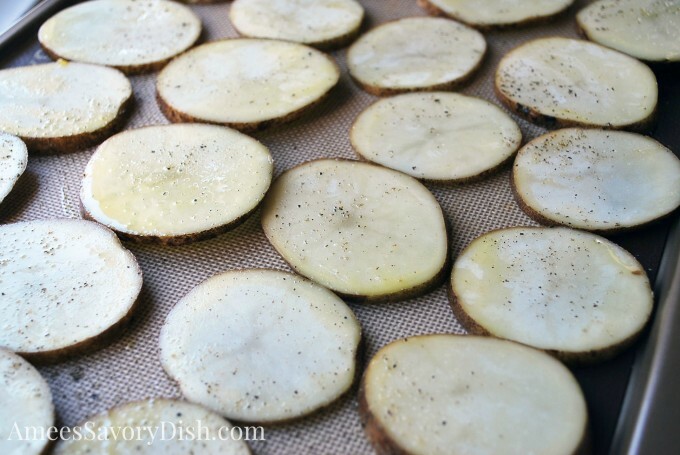 Sliced potatoes ready for the oven…. Baked to crisp-tender and ready for toppings…. 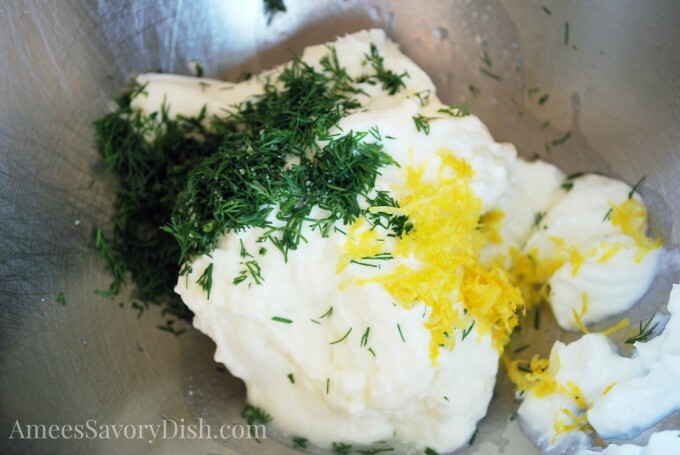 Whisk together yogurt, dill, lemon zest, softened cream cheese and salt. Top the smoked salmon potato rounds with yogurt dill sauce and finish with salmon, capers and fresh sprigs of dill. So good! 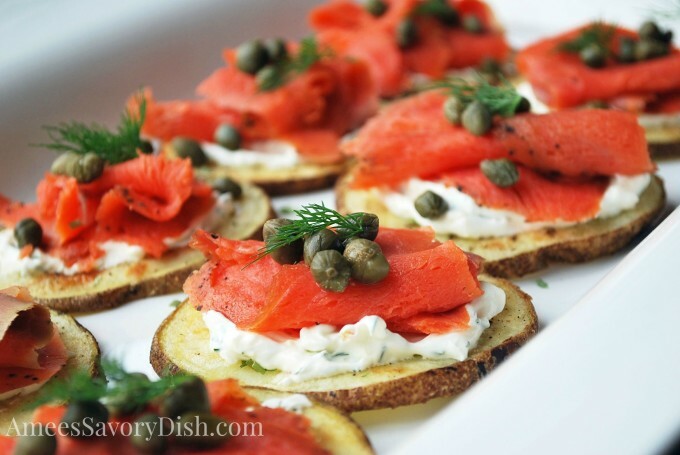 Enjoy this easy appetizer recipe for smoked salmon potato rounds! Slice potatoes about ¾ “ thickness and place into a large bowl of cold water to remove excess starch. Pat slices dry and place into a large bowl. Place slices on a Silpat or parchment lined baking sheet and season lightly with salt and freshly cracked pepper. Bake potatoes for 15 minutes, flip and bake for 10 minutes more. Potatoes should be just lightly golden, not crunchy. Sprinkle potatoes with chopped fresh chives and set aside to cool. Whisk together chopped dill, lemon juice, lemon zest, Greek yogurt, cream cheese and salt. Top each potato round with 1-2 teaspoons of yogurt sauce, a slice of salmon, a few capers and a garnish sprig of fresh dill. Seriously drooling. What a brilliant idea!! 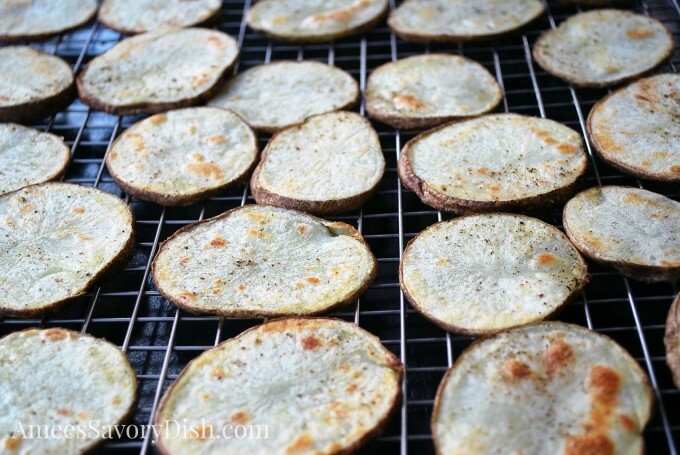 I love the idea of using potatoes instead of crackers! Amee, these look awesome! Such a perfect party dish. I just finished recipe testing a dish using sweet potato rounds- great minds…!